I recently started using the automated backup system Deja Dup which makes it very easy to set up automated, encrypted, incremental backups using the Duplicity back-end. This package has been installed by default on Ubuntu since version 11.10, so I expected it to be thoroughly tested and reliable by now. Unfortunately my backups became corrupted which meant that some files were lost, and it was quite difficult to restore others. This article will explain how I recovered my files, then set up a faster, more reliable alternative that's still encrypted. I tried running the process again several times, and tried the three different backup snapshots that were available, but the same problem kept occurring. I was starting to panic by this stage so I looked at the documentation to see if I could get more information about what was going wrong, and use the command line to get more control over what Duplicity was doing. I recommend reading the documentation listed at the bottom of the page if you have any doubts about what I'm doing here. I made a basic shell script to restore each folder in turn, but avoid touching the corrupt files. The corrupt files in my backup happened to be in /home/ben/Downloads/torrents/ so I had to specify each non-corrupt file/folder within torrents/ in turn. All of the other folders had no corrupt files so I could just specify the top-level folders and Duplicity restored all of their contents recursively without problems. With any luck all of the specified files will be recovered now. I now use an external hard drive with an encrypted Ext4 partition, then use a simple shell script that runs rsync to update my backups. I haven't got this automated as I don't have the external drive plugged in much, but now it's set up all I have to do is plug in the drive and run ./scripts/rsync-backup.sh in the terminal. If you have Ubuntu, search for and run the Disks app. If you have Xubuntu or a different distro like me that doesn't come with it, install the gnome-disk-utility package. Be very careful with this tool as you could easily wipe all of your data if you select the wrong disk/partition. 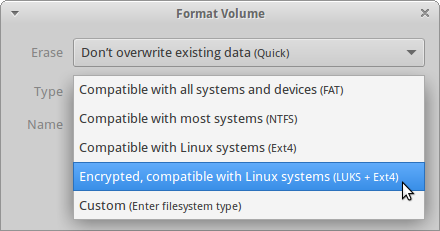 Choose a label for the partition and set an encryption key. Make a note of this password or you won't be able to mount the disk! 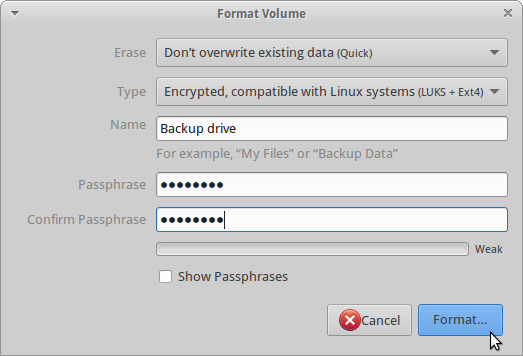 When formatting is complete, mount the drive and enter the password you just set. Without this password no-one can access your encrypted drive. Ubuntu will probably offer to remember the password for you in future. Next, make a simple shell script to run the rsync command for you. Make a plaintext file and make it executeable in file properties. Now you can run the script in the terminal by doing something like this: ./scripts/rsync-backup.sh. It will take a long time to copy all of your files the first time, but in future it will be faster as it will only be syncing changes. Salut Clément! Je n'ai pas personnellement utilisé Déjà Dup, mais je crois que vous devez lister les fichiers dans la sauvegarde en utilisant la commande duplicity list-current-files --time "2014-5-26T02:57:20+01:00" > sauvegarde_fichiers.txt, où 2014-5-26T02:57:20+01:00 est l'horodatage de la sauvegarde que vous souhaitez restaurer. Ensuite, vous pouvez essayer de restaurer les fichiers les plus importants. Si vous êtes chanceux, les fichiers corrompus ne seront pas parmi ceux que vous souhaitez récupérer. Je suis desolé, mais nous ne offrons pas un support gratuit par email. Si vous avez besoin de plus d'aide, contactez-nous pour obtenir un devis. Bon chance! Hi Clément! I haven't personally used Déjà Dup, but I think that you need to list the files in the backup using the command duplicity list-current-files --time "2014-5-26T02:57:20+01:00" > backup_files.txt, where 2014-5-26T02:57:20+01:00 is the timestamp of the backup that you want to restore. After that, you can try to restore the most important files. If you are lucky, the corrupt files will not be among the ones that you want to recover. I'm sorry, but we don't offer free email support. If you need further help, please contact us for a quote. Good luck!